On the night of April 12, 1912, off the coast of Newfoundland, one of the greatest disasters of all time took place – the Unsinkable Titanic struck an iceberg and sank with a horrendous loss of life. On board that ship was Sherlock Holmes’s friend, Victor Trentacost – his only friend other than Doctor Watson. The news of the disaster leads Holmes and Watson to reminisce about one of their earliest adventures, now over thirty years ago, when the two of them and Victor went to sea. It began as a sailing race and ended as a tale of murder, kidnapping, piracy, and survival through a tempest. Their adventure takes them to Portsmouth for Cowes Week – one of the world’s great festivals of sailing – and then on to the prototype of the dangerous Fastnet Race. This new Sherlock Holmes mystery is a tribute to the original story from the Canon, The Gloria Scott. 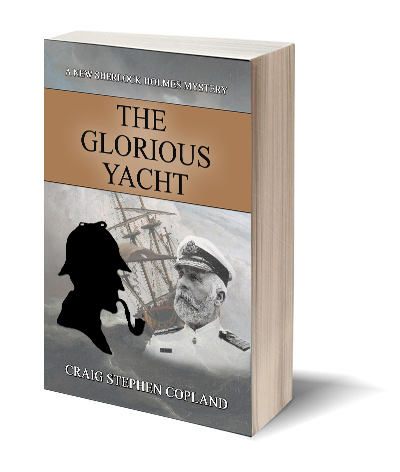 It is the twenty-second in the series of New Sherlock Holmes Mysteries by Craig Stephen Copland.